Earn the top marketing research degree in the nation. Broad’s Master of Science in Marketing Research (MSMR) program equips graduates for success in an ever-expanding industry. We prioritize the real-world application of knowledge and skills to best support students who want to accelerate their careers in marketing research. For both our full-time and online graduate degree programs, our world-class design, learning format and classroom instruction provide graduates with a competitive edge. and #7 across all marketing programs. 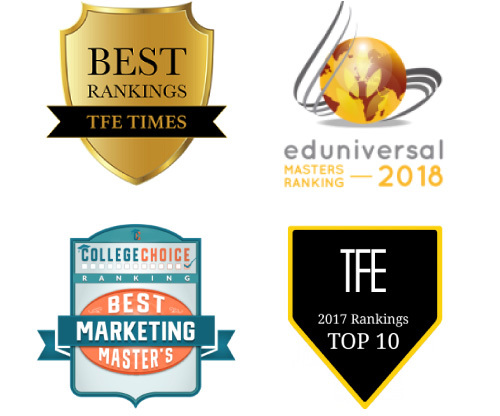 The Master of Science in Marketing Research program at MSU has been ranked by Eduniversal, College Choice and TFE Times as #1 among master’s programs specifically in marketing research in both the U.S. (TFE Times and College Choice) and North America (Eduniversal). Whether students choose to go online or on campus, they experience the same courses taught by the same leading professors. The MSMR at Broad offers both fall and spring full-time cohort options, as well as a part-time, 100 percent online option. Entering my senior year at MSU as an advertising major, I was unsure of my next move post-grad ... I discovered the MSMR program ... Little did I know, I would fall in love with the marketing research field thanks to the amazing faculty and courses offered in the program. Tap into deep marketing knowledge. Marketing faculty members in the MSMR have doctorates in marketing, experience as marketing research consultants and valuable contributions to leading marketing research and academic journals. This world-class academic expertise is paired with engagement with private sector leaders in marketing research, such as senior-level executives at the country’s leading marketing research firms, corporations and strategic leadership organizations. MSMR students participate in marketing research projects with real clients and can even participate in industry publications. And with the program being designed for an industry with premier job growth and salaries, MSU’s Master of Science in Marketing Research is ideal for both today’s job needs and the needs of tomorrow. We accept applicants on a “rolling calendar” basis, so applicants are welcome to apply throughout the year to any of our three cohort options. Contact msmr@broad.msu.edu for more information on the master’s program. The Master of Science in Marketing Research is a 34-credit program consisting of specialized marketing research courses. We offer three different programs: fall full-time, spring full-time, and online. Eligible MSU students can dual-enroll in the M.S. in Marketing Research program either fall or spring semester during their senior year of undergrad. The Master of Science in Marketing Research program tuition rates include the price of books and statistical software needed for the program. Get answers to the most frequently asked questions regarding the MSMR at Broad. Follow the MSMR program on social media! For additional details on the Broad Master of Science in Marketing Research program at MSU, complete our brief request form. We look forward to connecting.